Red Pepper Quilts: Oh Boy! The end of the long weekend is fast approaching (we celebrated the Queen's Birthday today), and it has been very relaxing without the usual weekend sporting commitments. This has meant some extra time for sewing and I've chosen a simple squares quilt project, with fabrics that entail much detail. Cuteness galore! 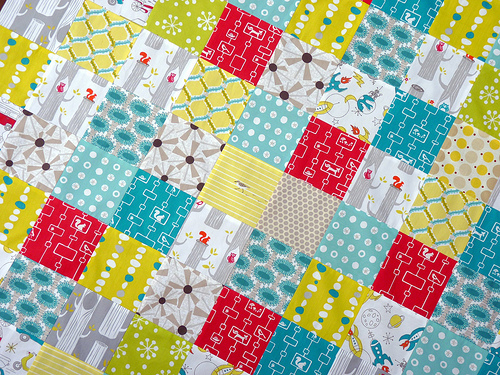 As soon as I saw the Monaluna Circa 50 fabric collection by Birch Fabrics, I knew that this fabric was just waiting for me to make a quilt for a little boy. From experience I know that boys just love "I Spy" quilts, and the Circa 50 fabrics are teeming with all those things that little boys just love; from rockets and moons, to squirrels and mushrooms. I've teamed up the Circa 50 fabrics with the Cloud9 - Beyond the Sea fabric collection. Both are wonderful quality organic fabrics, and I think they really compliment each other. After wrangling with the super lightweight voile fabrics last week, these fabrics were a breeze to sew with. Backing, basting and quilting still to come. Happy sewing. Those two lines look amazing together Rita! I have the Cloud 9 garden line sitting right here on my cutting table trying to decide what to do with it. Simply beautiful. Love the fabrics. Glad you had some time this weekend to sew things up. Those two lines look great together. I have all of Circa 50 and some of Cloud 9 and you've given me some ideas. Thanks, as usual! the fabric looks great together - so nice and bright and fun looking to. rita , you have such a good eye in playing colours and putting together nice prints....everything you churn out becomes such gorgeous pieces of quilt...love them! Oh! Lovely! I like the fact that there is not an easily seen pattern. Fun fun fun. I love that chartreuse with the aqua and gray and red. Very lively! these two line compliment eachother very well!! 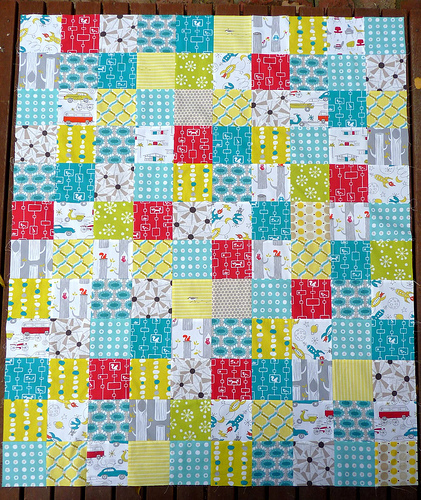 Love the brightness- fun quilt!! Oops ... Dan Prager is actually my husband. I'm on his computer and forgot to log out of his Google account. So that earlier comment is from ME!!! These fabrics work so well together! So fantastic!!! I LOVE this line of prints! Love the color combination!! I really like that Circa 50 fabric!! Gah - that is fab! I absolutely am in love with those prints and colors. Love your little quilt!